There’s a very telling scene and line in The Gift, the new thriller written, directed and starring Australian jack of all trades Joel Edgerton (you know, just because you’re from another country doesn’t mean you can’t leave a few jobs for the locals, mate). Husband and wife Simon and Robyn have recently moved to California for Simon’s new job. The town is Santa Clarita (if my memory serves) where Simon grew up and went to school. While out shopping the couple run into Gordo, an old classmate of Simon’s, someone Simon claims he can barely remember, though Gordo seems to have no trouble remembering Simon. Gordo suddenly starts showing up at the couple’s house with gifts, though it’s hard to tell whether he’s creepy or just socially awkward. But one night he leaves after having been invited to dinner (well, has sort of forced them to invite him to dinner) and Simon says there is something odd about him. The reason this is telling is because it is also somewhat ironic since, by this time, it’s rather clear that there is something odd about Simon. At first glance, Simon is the type of person that everyone gravitates to, is popular and ingratiating, the alpha male. But there is also something just a little off about him, something of the snake oil salesman, something that lacks sincerity, a feeling he gives out of condescension and superiority. One reason for this is perhaps the brilliant casting of Jason Bateman in the role. Bateman is never good at playing sincerity. There is something faintly dislikeable and untrustworthy about him that slowly grows on you the more you are in his company. So what is really going on here? Who is the one who is truly odd? Gordo or Simon? And how well did they know each other in high school and what is the truth of what really happened back then? And is Gordo trying to do something about it now? The Gift is a neat little psychological thriller that rarely lets you sit back and relax. Edgerton keeps throwing in sweet little plot twists where, just when you think you know what is going on, you suddenly find out that’s not what is going on. And just when you think you know who the victim is, you suddenly find out that, no, it’s far more complicated that than. What is perhaps most amazing is Edgerton pulls off the whole thing without one drop of blood being spilt. There are some jump and go boo moments, but overall, this is a movie driven by unnerving the audience, not by throwing gobs of plasma in their face. Robyn is played by Rebecca Hall and she does a very nice job of holding the whole thing together since, in spite of the fact that Simon and Gordo are the ones playing the games, she is actually the central character. She is the one who has to realize not only what the truth is, but has to decide what to do about it. It’s a nice understatement of a performance. The plotting is not perfect. There’s a through line about monkeys which I’m not convinced has a real payoff. And one of the major plot turns seems to come out of nowhere and not really be any doing of any of the central characters, so it’s not quite as satisfying as it might be (there might be a way to connect this incident to Gordo, but I’m not sure even Rube Goldberg could do it). Still, for a nasty bit of summer entertainment, I can’t see how you could possibly go wrong. With Allison Tolman also standing out in another understated performance as Simon and Robyn’s next door neighbor, and Wendell Pierce, who just seems to be all over the place these days, as a police detective. 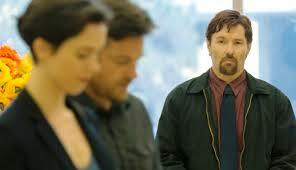 And of course Joel Edgerton as Gordo, who acquits himself rather well in all departments. 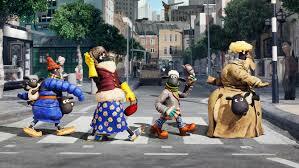 I’m not sure what to say about Shaun the Sheep Movie, an animated film of a somewhat ovine nature based on a character that first appeared in the Wallace and Grommit short A Close Shave and went on to have his own TV series, except to say that not only is it not a baaaaaad time in the theater (see what I did there? See? See? ), it is, in fact, quite a fun time. Written and directed by Mark Burton (who also helped give us Madagascar, Chicken Run and The Curse of the Were-Rabbit) and Richard Starzak (who helped give us Shaun’s TV show), it’s a splendid bit of silliness of no particular importance, but who cares, it’s much too entertaining to quibble, about Shaun who is bored with the same old day in, day out routine his farmer owner puts them through and decides to manipulate things so he and the others can have some time off. But since you wouldn’t have a movie unless something goes wrong, well, something goes wrong, terribly, terribly wrong as a matter of fact, and the farmer ends up in the city and loses his memory, so Shaun and his mates have to find him, get his memory back and return him to the farm while trying to stay out of the hands of an animal containment worker who takes his job just a bit too seriously. 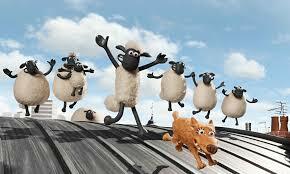 There is no dialog in the movie, it’s all actors suggesting the characters are saying something. So the whole movie is a series of sight gags that are more often than not quite gaggily. Have fun, get out of the heat, buy some popcorn. Enjoy.